Stable, agile, and an absolute joy to drive: experience the thrill of a motorcycle on every trip to the grocery store. Instant torque accelerates you from 0-60 mph in 7.5 seconds and the SRK’s optimal center of gravity and balanced platform design make it an extension of your will to move, up to a top speed of 80 mph.Carries 2 people and their gear? Check. Goes 70 or 130 miles? Check. Park anywhere? Charge anywhere? Check, check. Add in solo HOV lane capability, an expandable frame architecture and enclosure options for comfort and utility in a variety of weather conditions and for different vehicle uses. 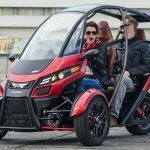 Checkmate.With a base price of $11,900, this ultra-fun three-wheeled daily electric motorcycle for us all is a giant leap beyond today’s cars: at an estimated 230 MPGe, the SRK is almost 10x the efficiency of the passenger vehicle fleet, has 1/4 the mass footprint and comes in at 1/3 the price. Choose from a variety of enclosure options to suit your needs, whether it’s protection from the elements or to secure your cargo. Outfit the base model with half-door or full-door soft or hard panels, or combine an enclosure with removal of the back seat to create the Deliverator, the ultimate delivery fleet vehicle. 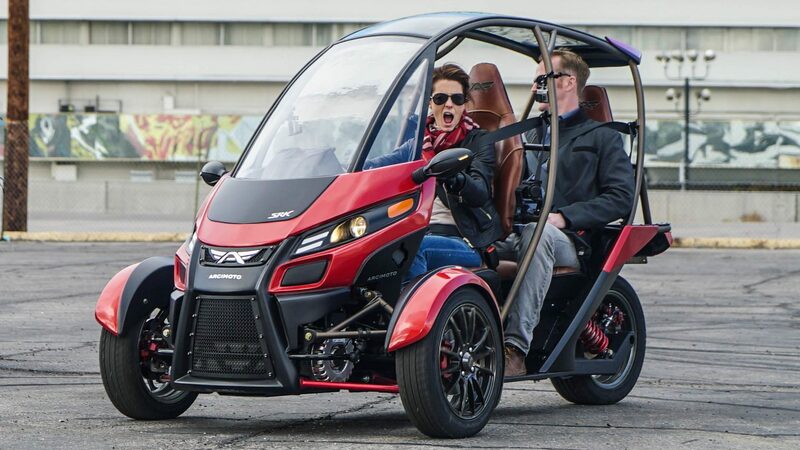 I’m not gonna lie, it looks a bit strange and unconventional, but I’m definitely a fan of the Arcimoto SRK. The high top speed is a huge selling point for me as well as that it only needs an hour and a half to recharge, maybe three depending on the outlet. It drives really well and feels very nicely planted to the ground, not at all tippy. If you can readjust to the unusual look of this motorcycle, it’s a great ride.